The southeasterly slope is a good soaring site that is usually quiet due to the long uphill walk. The southwesterly face suits light, thermic conditions, but is unsuitable for ridge soaring as in soarable wind strengths the upwind terrain creates turbulence. Pilots new to the site will need to identify and familiarise themselves with the bottom landing fields. Land in Mr Critchlow’s fields (see map) or across the railway in the large, flat field next to the road opposite the white house. The upper fields slope quite steeply but are large so shouldn’t be a problem. When using the landing field by the road, flying low or reducing height over the campsite to the west of the field must be avoided whenever possible. Do NOT land in the fields between the take-off and Edale village. Landings in the large fields next to the railway are tolerated if you overshoot. Check for lambing closures in spring. If some of the landing fields have livestock in, please try to land in one of the ones without livestock. It is particularly important to ensure clearance from airspace as it is can be very easy for inexperienced pilots to rapidly gain height in wave conditions. For the southeasterly launch park in Edale village or just off the track up to Shaw Wood Farm (SK 117 853). You can see the track where it crosses the railway and meets the road (SK 119 850). Please do not park in his yard at the top or block the track. He has given us permission to walk through his fields (no footpath marked on map) up to the take off. For the southwesterly launch there is a car park on the road towards Upper Booth at SK 107 846. 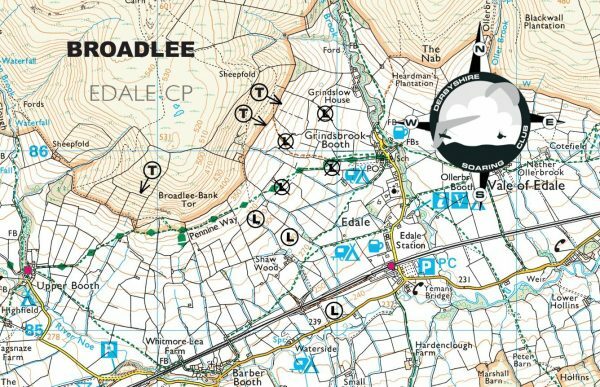 If parking in Edale village, the southeasterly take-off is accessed by taking the Pennine Way westwards and turning right up the footpath that climbs up to the shoulder of Broadlee Bank, to the right of the trees. This is a shorter walk than from the farm, but you’ll have a longer walk back to your car afterwards. For access to the southwesterly take-off, walk to Upper Booth and take the Pennine Way eastwards for 600m to where a small track leads steeply up the southwesterly face. This page shows records for this site. Some of the older records may not be very detailed. More recent records may have an igc file available – you can generally find this by following the tracklogs link which will normally lead to either the paragliding or hang-gliding XC league page for that flight.